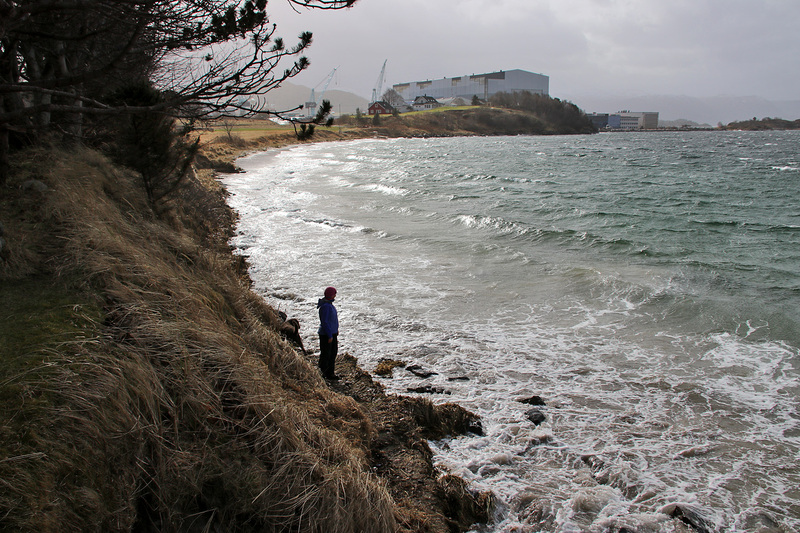 Monday: Today I went to work in Ålesund, and everyone wondered what the heck I was doing there on a Monday. It’s nice to keep them on their toes, never knowing when or where I’ll pop up. When I left work, it was fairly sunny all around. 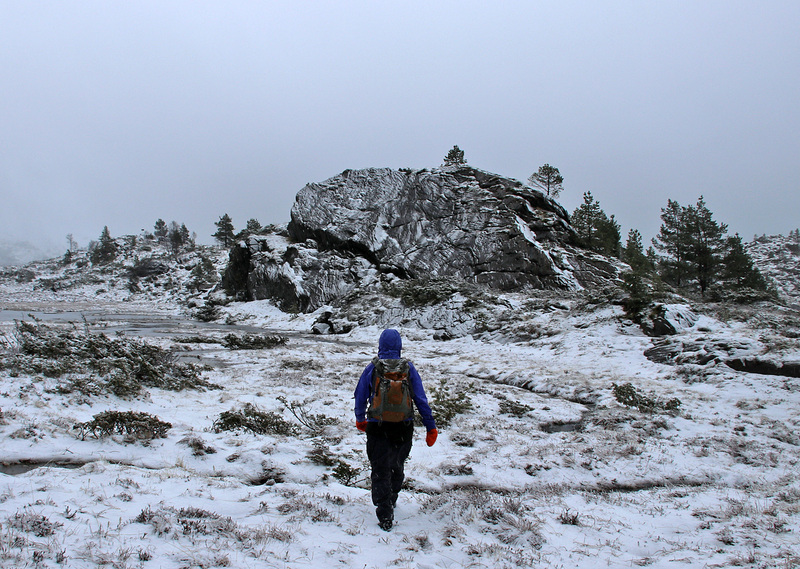 But I didn’t take anything for granted, having seen it snow a couple of times earlier in the day. 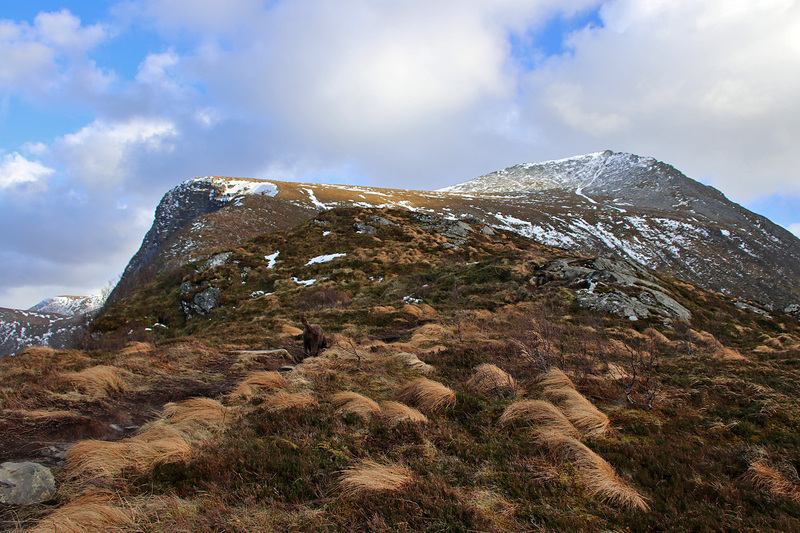 I chose to go to Grødet above Vatne. 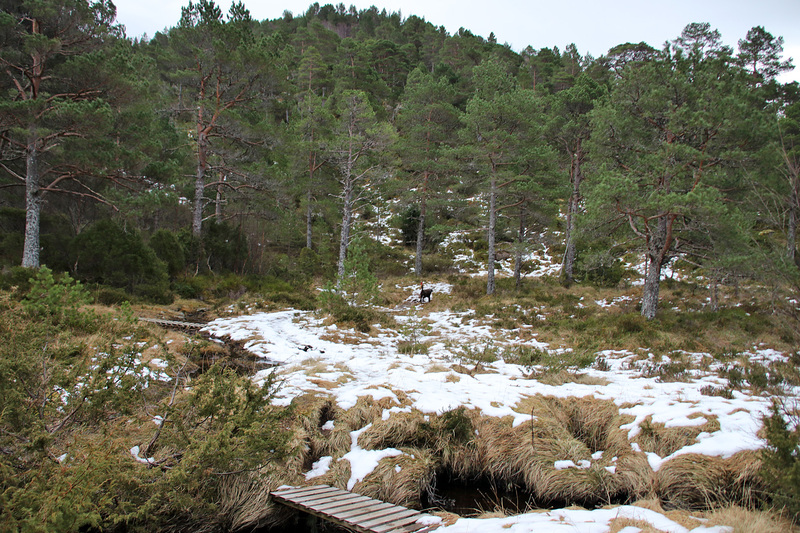 The forest road to lake Ulvestadvatnet would surely not offer deep snow, and if we were in luck, someone had broken the trail up to Grødet too. 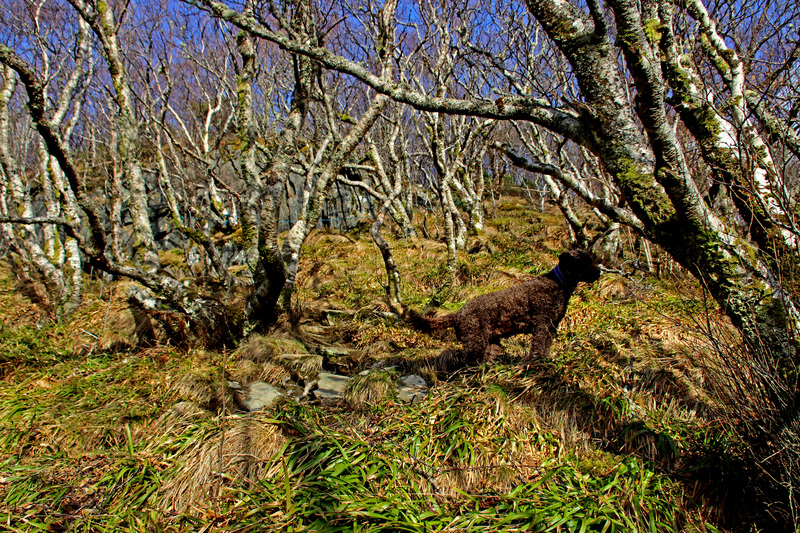 The hike started out nice – sunny and no wind. 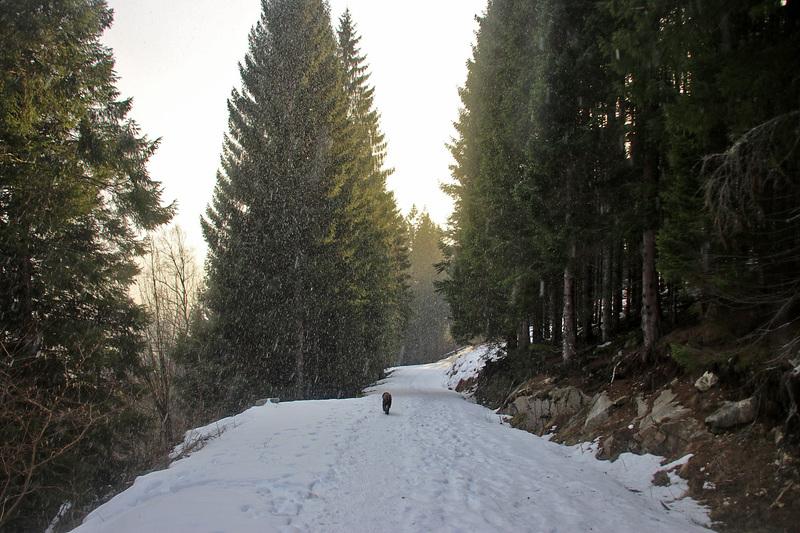 Further up, I met a man – whom I took for someone who walk to the lake every single day. I don’t know. Just got the feeling. 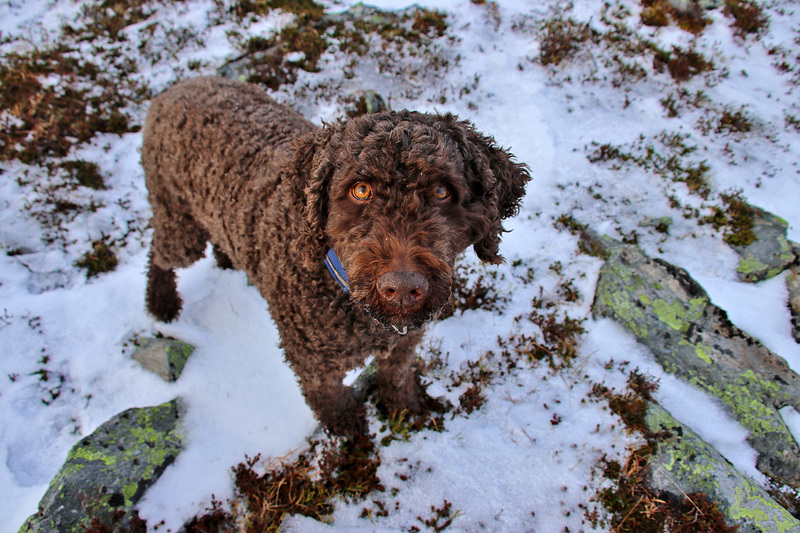 I asked him if he had seen footprints towards Grødet. “yes, yes, yes, yes“, he replied. And there was hardly any snow either, he could tell me. I got another feeling, and that was either he didn’t understand my question, or he had no idea about what I was talking about. 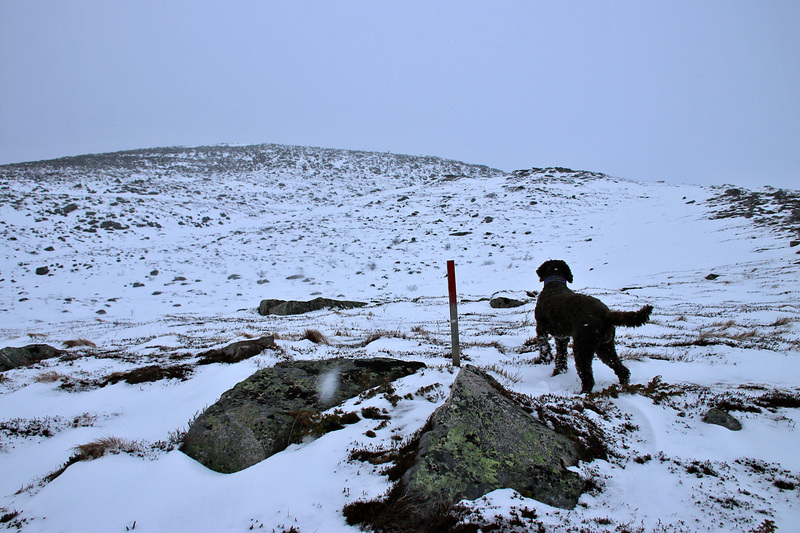 I’ve been up here a couple of times before, on snow, and I’ve never seen footprints on the path to Grødet. 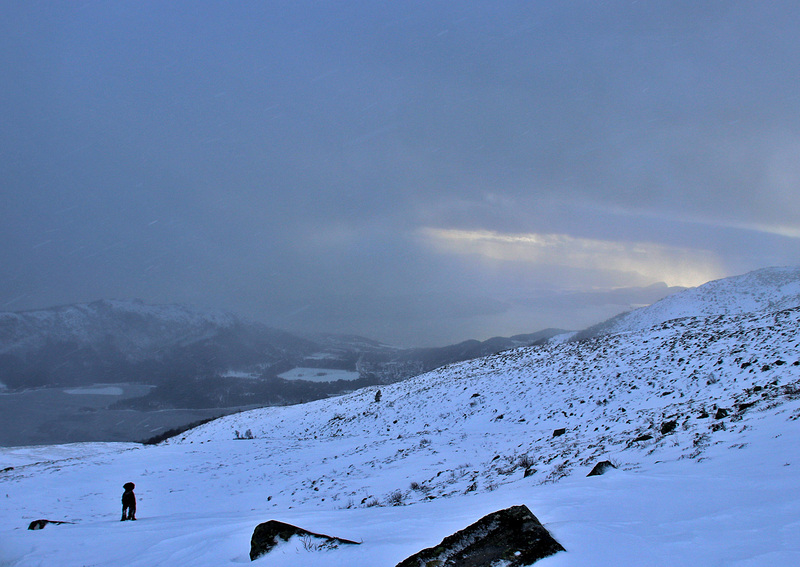 As we got to the top of the hill, I could see that “something” was coming our way. Hmm… what’s that over the hill? 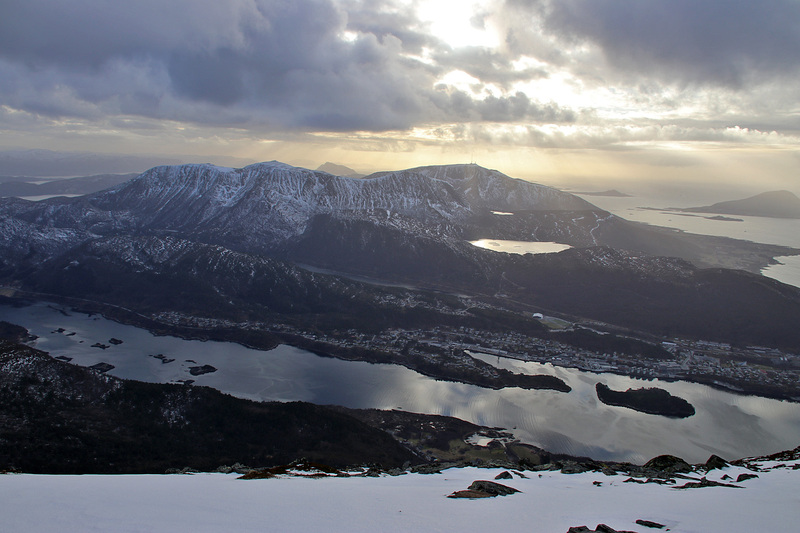 When we came above the forest, I could see that Ålesund was getting their fair share of that “something” I had seen earlier. 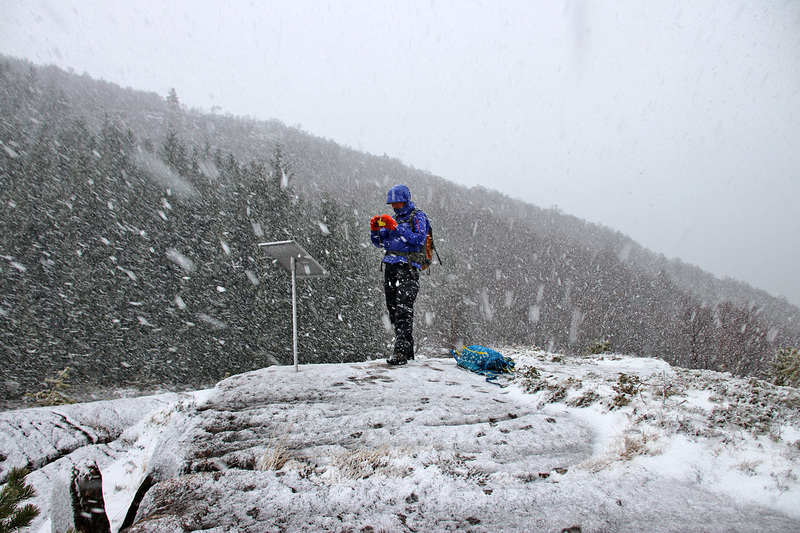 It had begun to snow (of course), but fortunately the wind wasn’t too bad. 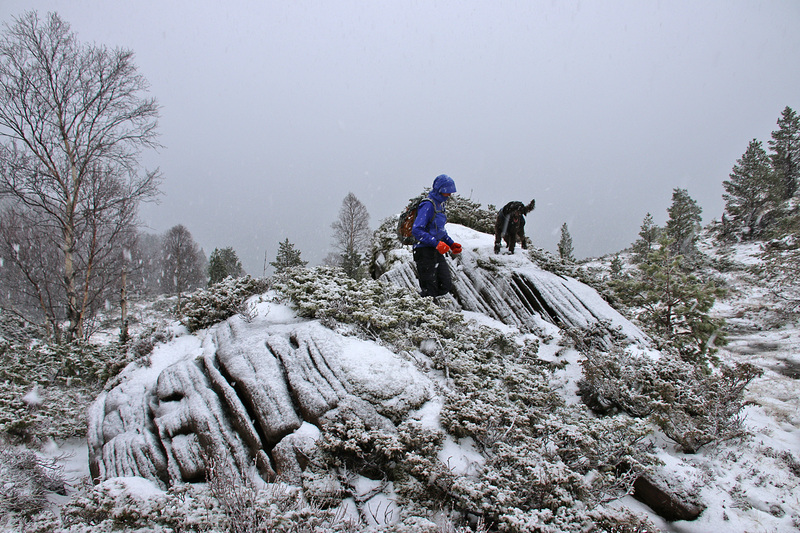 When we reached the top, my thoughts about the usual round trip hike was long gone. Now I just really wanted to get back home. Which was 3 hours away at this point. 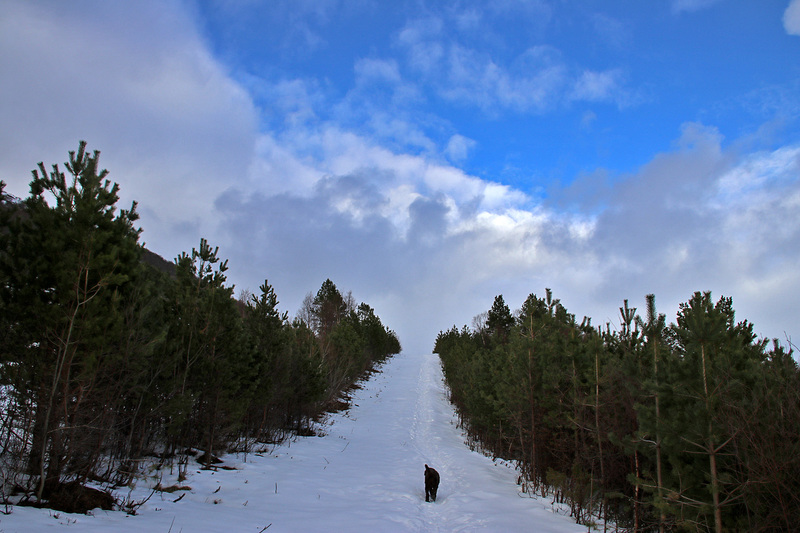 On our way down the mountain, I – or should I say we – noticed that it was clearing up. I hoped that the sunshine was about to return. 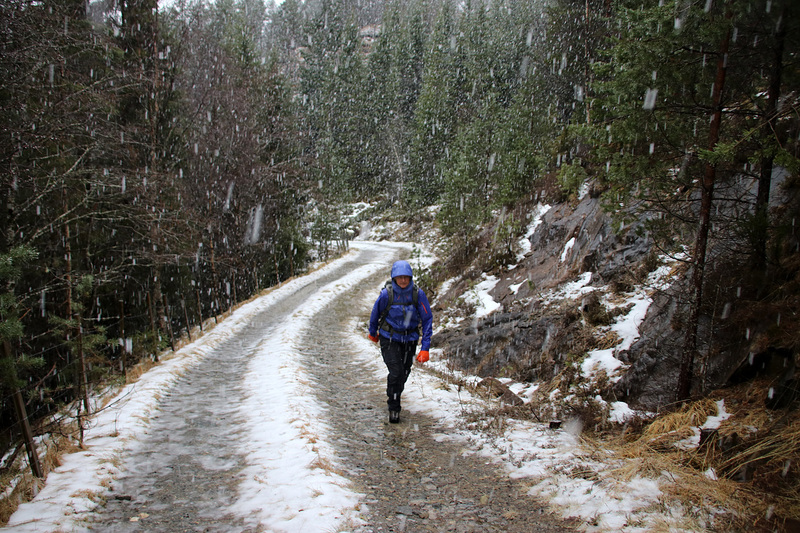 When we got back on the forest road, I noticed a person further up the road, coming down. Like, 100 meters away. I only looked at this person for a split second, but the image stuck for a while. Clearly a girl because of the the hair! The long, long hair. Who’s got hair like that, and why isn’t she wearing a hat? It’s cold outside! I had to turn around to take one more look, but I couldn’t see her any longer. Further down the road, I noticed a lot of manure next to the road. Spread around. What? That wasn’t there when we went up. Then I saw tracks from hooves and started to get the idea. I turned around and I saw the girl far up on the forest road. 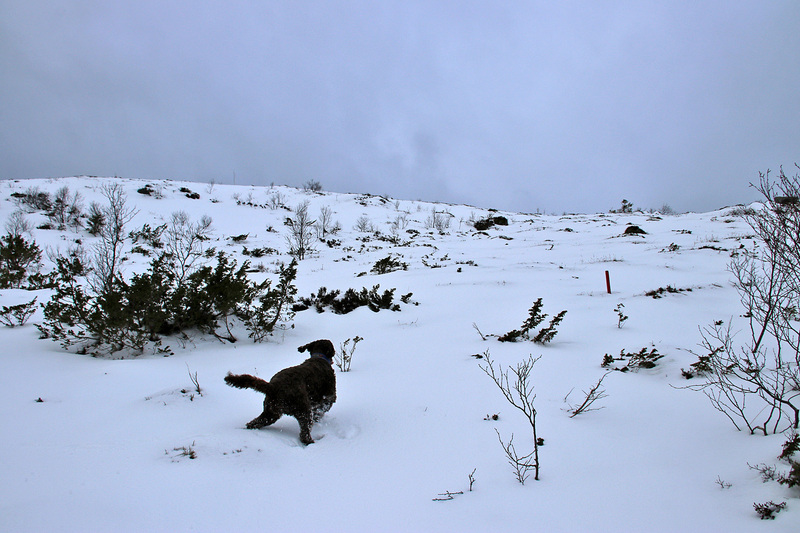 I took my zoom lens and – yup – she was leading a horse – walking behind her – with the withers swaying back and forth. The “hair” mystery was solved. And the sunshine sort of did return. But it didn’t stop snowing. A weird, but fun hike. What’s that over the hill? 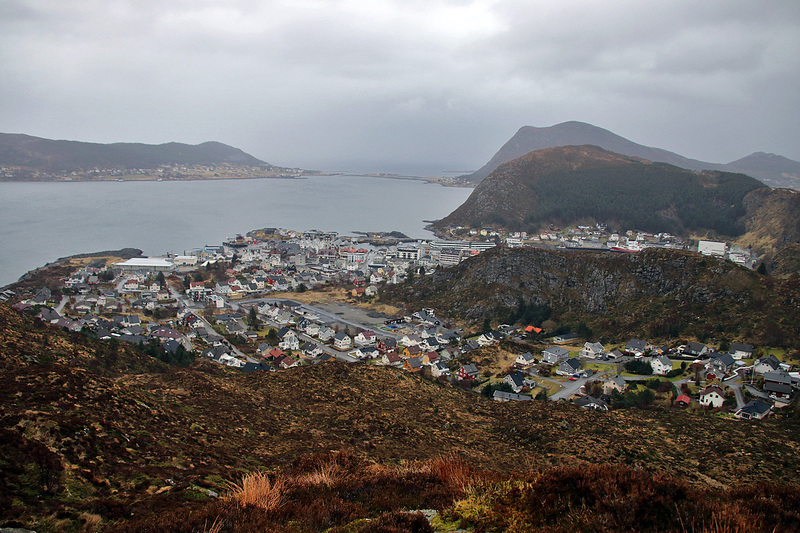 Tuesday: Another Ålesund day, getting up at 5am. But initially, the day gave me energy. 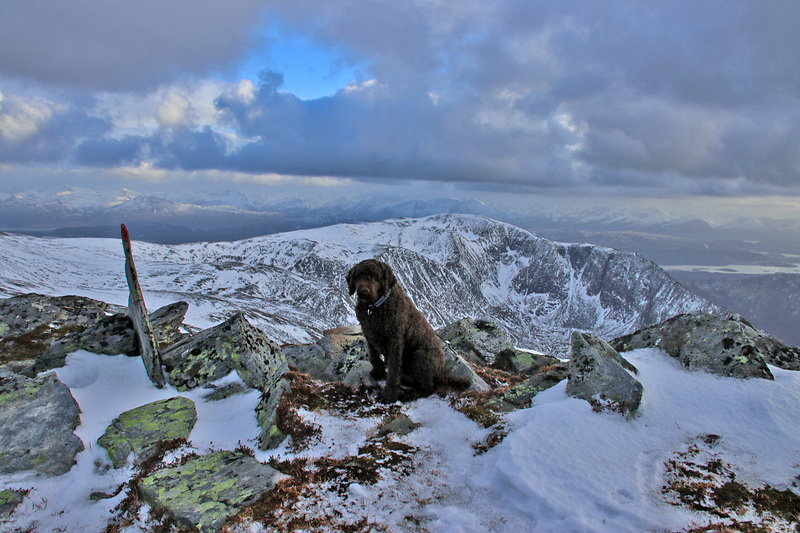 The weather was stunning and I could picture myself ski a 1000m mountain after work. But when I left work, I was so tired. 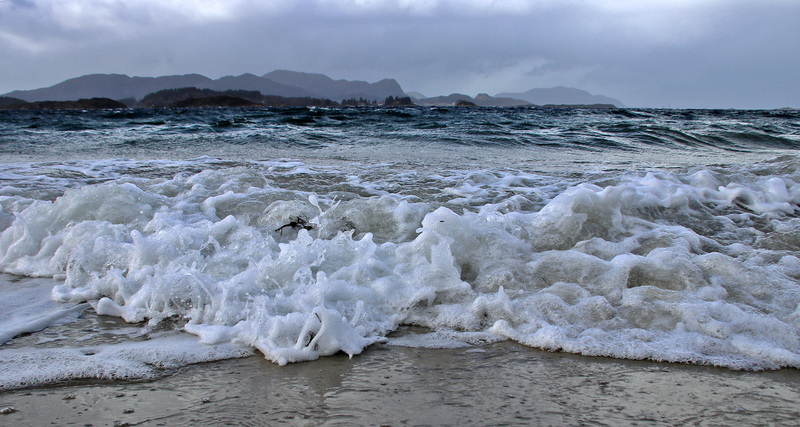 The sky was grey, it was windy and it looked as if it would start to rain any minute. I figured I had earned a resting day and decided to just drive home. Once home, I announced resting day to Karma and promised to take her around the neighbourhood once I had a few minutes on the floor. The dog just sat there, quiet, staring at me, waiting for whatever-is-going-on to pass. OK, the Heida top doesn’t require much effort, and who knows – something fun COULD happen. The only way to find out was to go out. 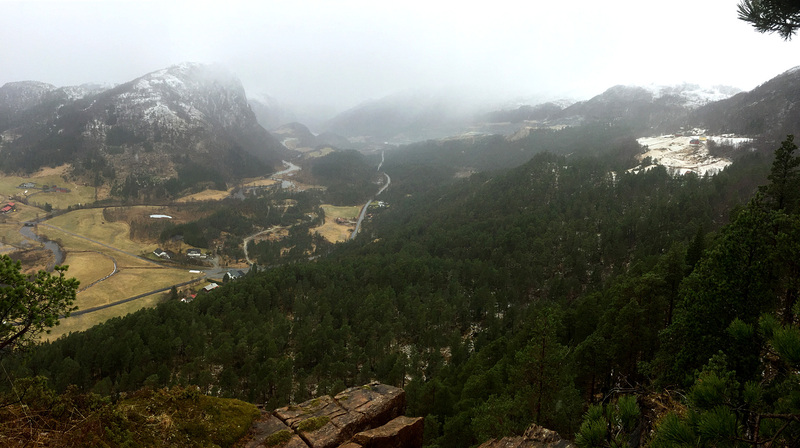 We drove to the regular Heida/Gyrinakken trailhead at Leikong, and on our way up, I decided to see if I could find a path down the east side. And if I didn’t, I would still head down the east side. On our way up the forest, I noticed a really cool tree that I just had to climb. Once done, my mood was much better. Will be right back down! 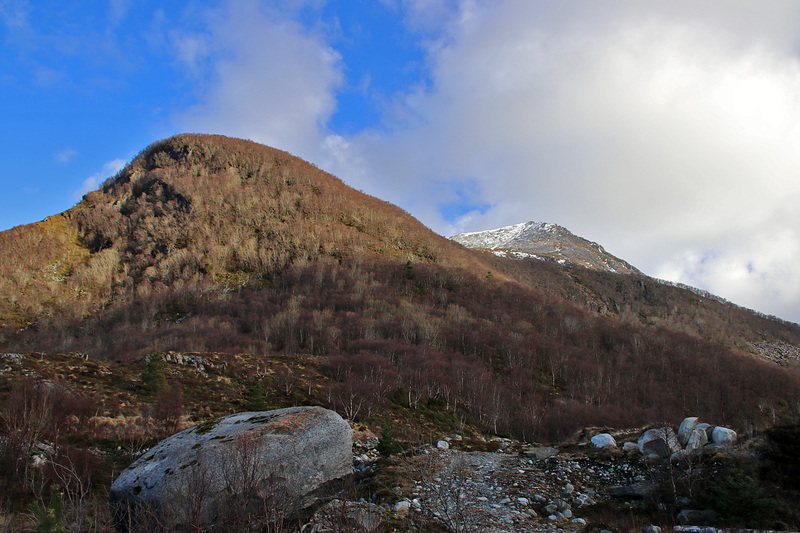 Then we reached Heida, and I started to look forward descending where I’ve never been before. 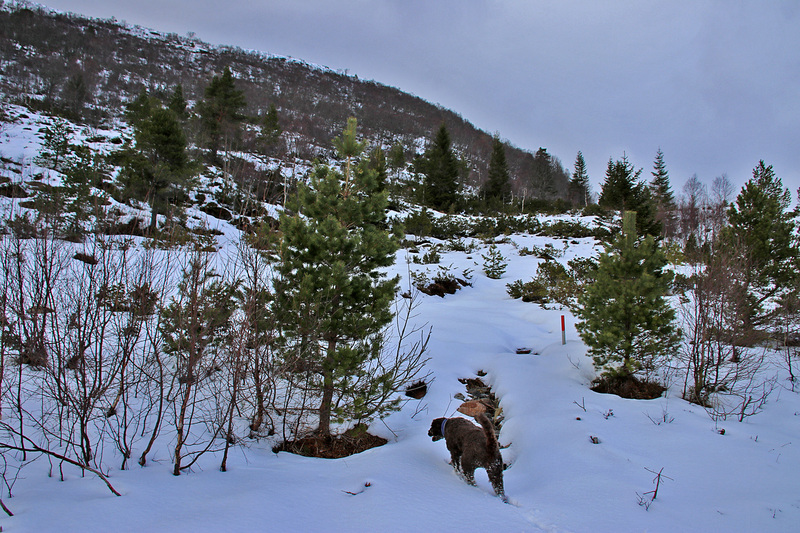 I found a path which took us down to a fence near Jøsokbakken. 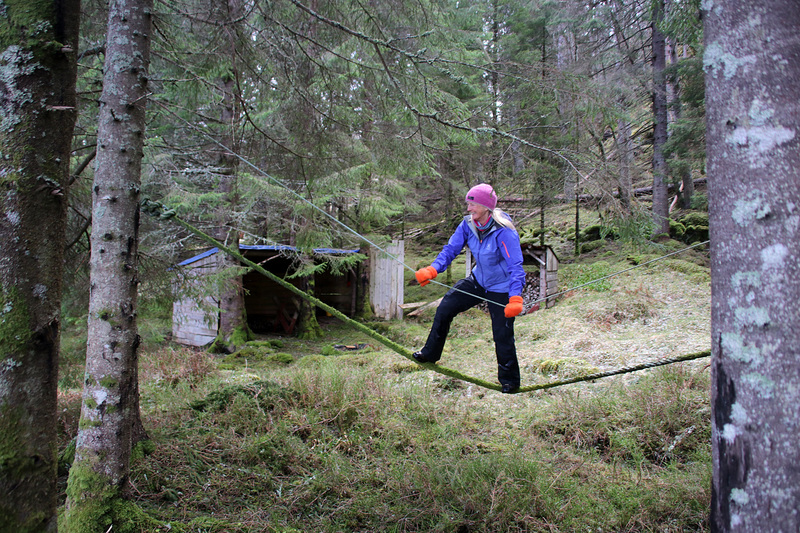 I didn’t want to climb the fence, so I tried to find a route down a steep forest section. That went fine, we reached the main road shortly after. 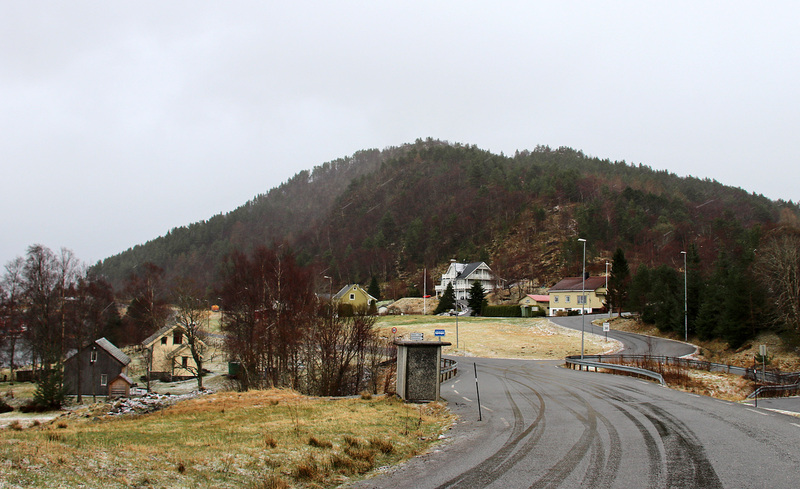 Then we headed up the Kleppeåsen road and I decided to visit the Kleppeåsen top – where I hadn’t been since 2008. 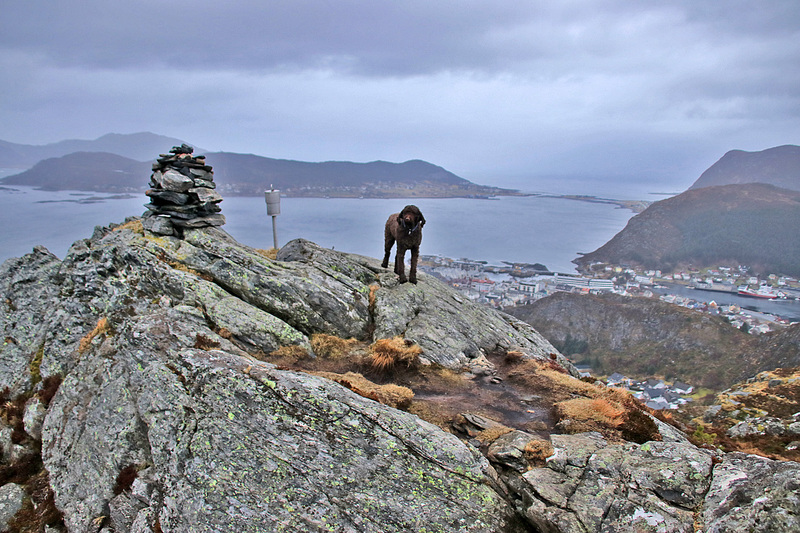 On the top, I discovered a path down the west ridge, and followed it down to Jøsokvegen. Then we followed the road past the school back to the trailhead. 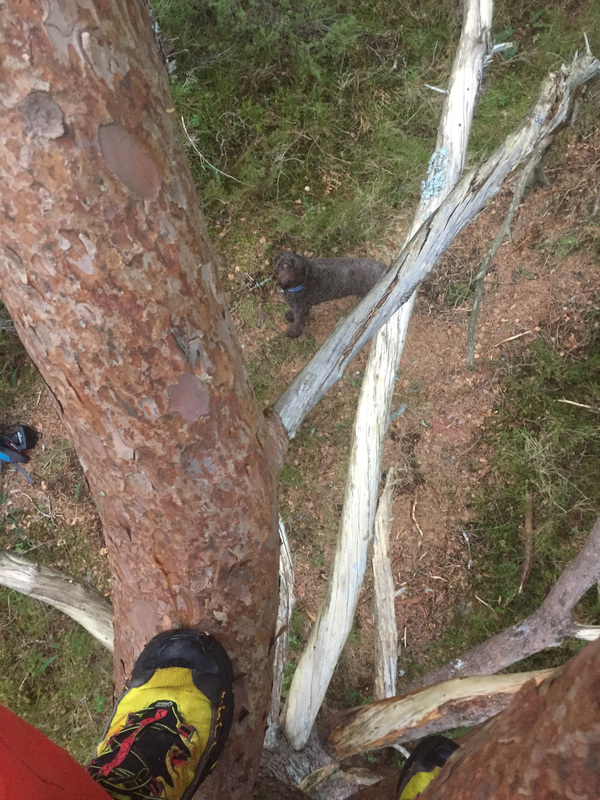 So in sum, all positive: one tree climb and discovery of two new paths. And then it really started to rain. 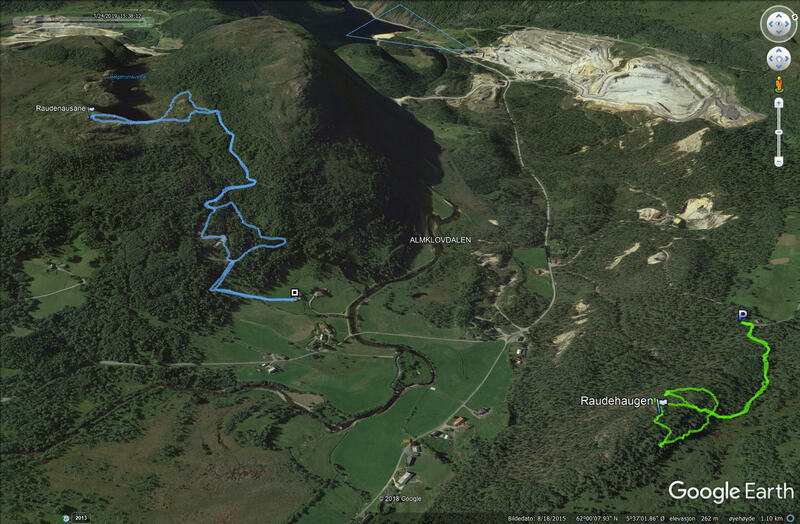 Wednesday: After work, I was driving to the Rjåhornet (600m) trailhead when it suddenly started to rain. And the winds picked up too. My inspiration for hiking plunged like a meteor from the sky, but now that I was in the car, I had to find a substitute. 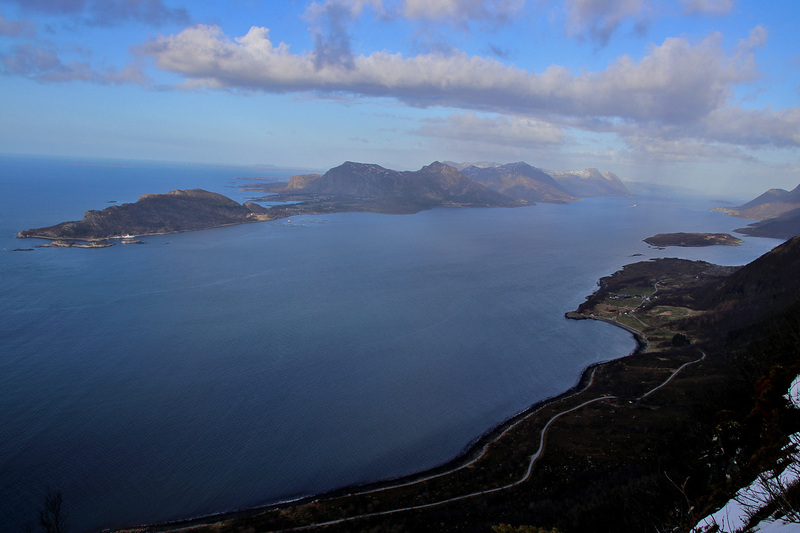 As I hadn’t been to Igesundshetta on Bergsøya so far this year, that would be my destination. More importantly, the elevation was low! I parked where I used to park, giving me a perfect position for a round trip hike. 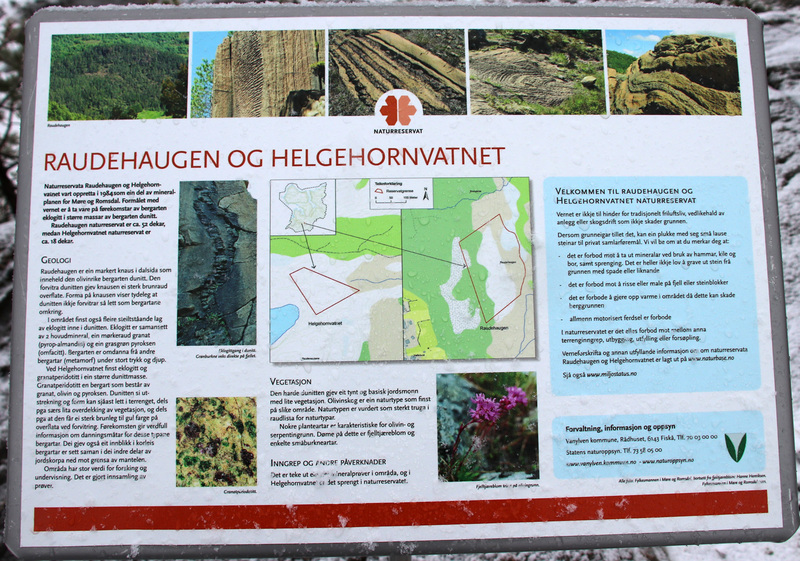 Opposed to normal, I headed for Storehornet and Igesundsvarden first, opposed to the high point (Igesundshetta). 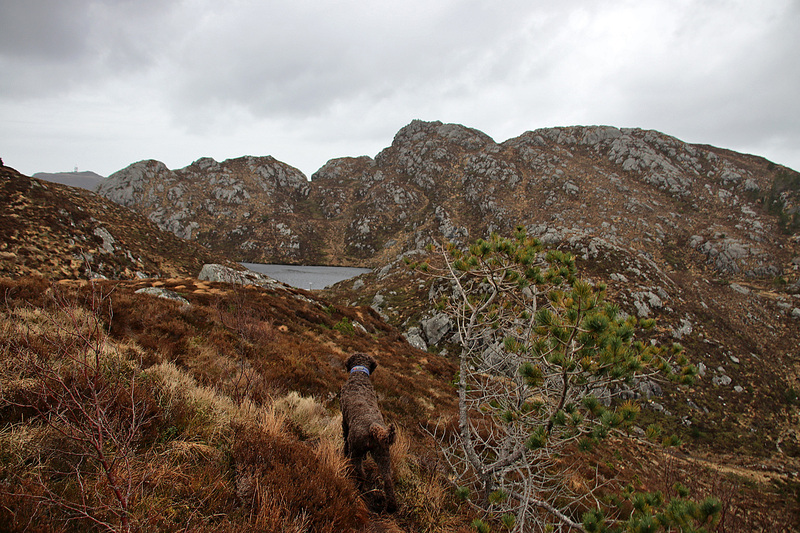 I like this ridge walk. Up and down, up and down. Not too muddy either. The only downfall that was that every now and then we got “washed” by incoming rain showers combined with a strong wind. But fortunately, the showers passed and we were able to continue the round. 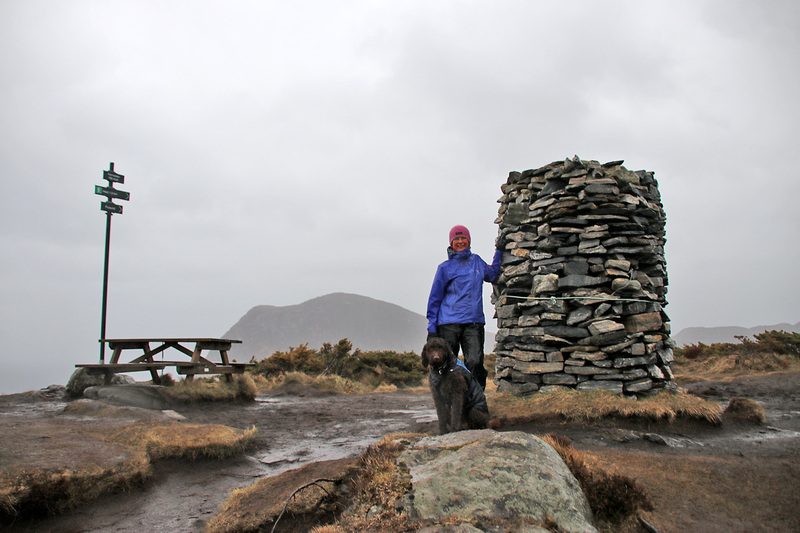 I would have completed the round trip hike if the showers had come more frequently. 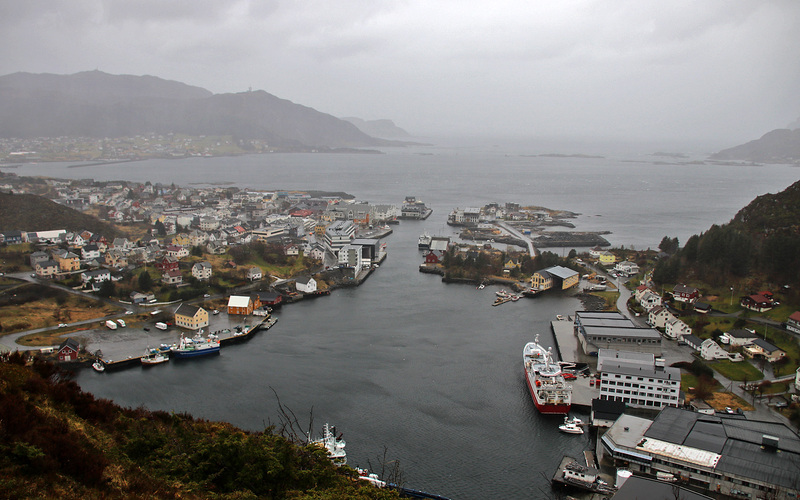 Wednesday: In Ålesund, for the 3rd time this week. And when I left work, I had no idea where I would end up. Except for in the traffic jam at Moa, for sure! On Tuesday, it took 30 minutes to get from Lerstad to Moa. 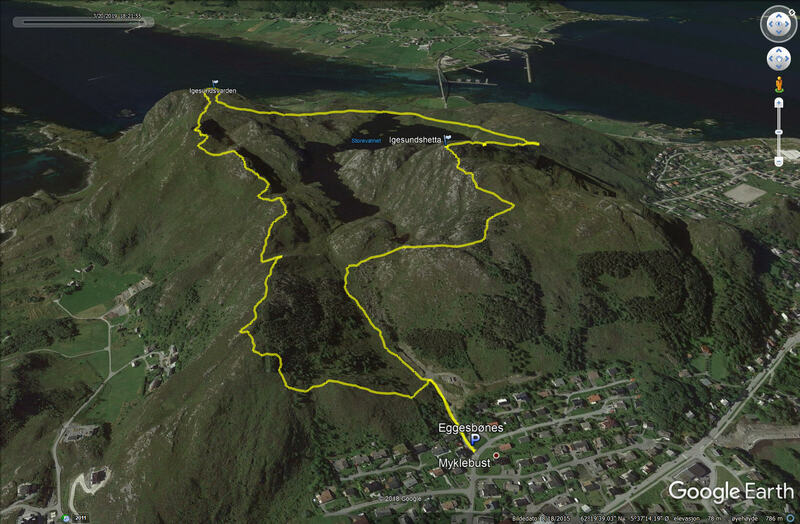 OK, I’ll go for Urfjellet from Slyngstad. But the road to the trailhead was closed. 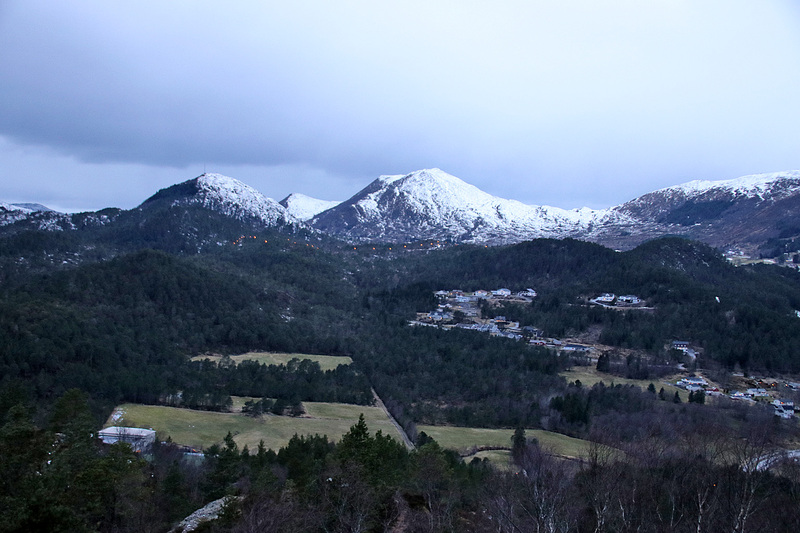 OK, Urfjellet from Reme then. But when I got there, I didn’t find any parking and lost inspiration. Now that I was here, I might as well drive to Helland and hike Hellandshornet. Easy parking (except for a rough road) and a nice and steep hike straight up from the car. We were on our way by 16:18 and it felt good to pace myself up the steep forest. 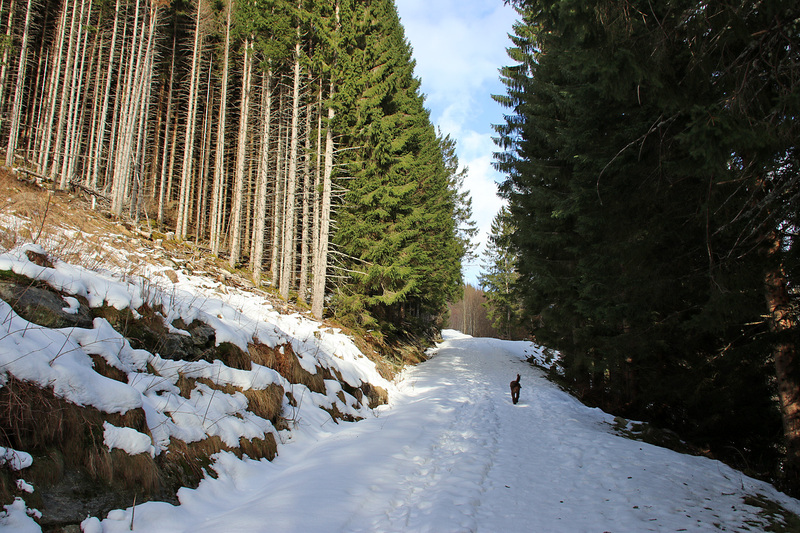 I even got a strong feeling of spring in the forest. 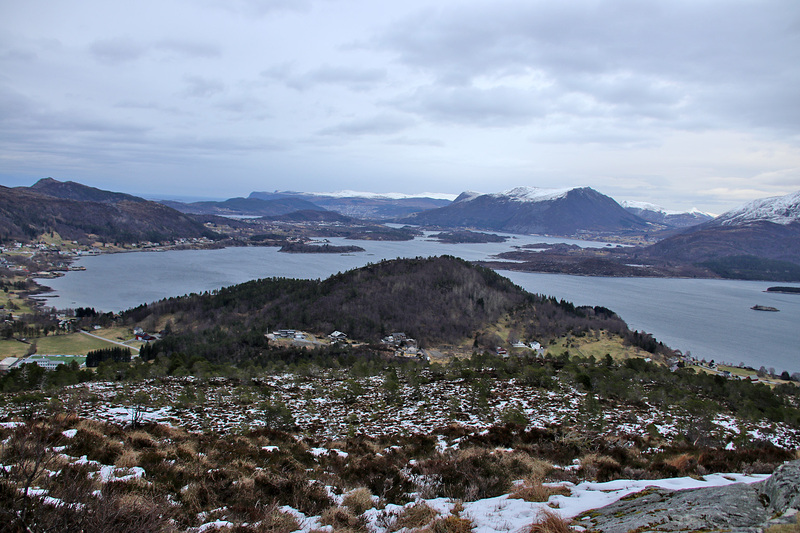 Above the forest, the terrain isn’t so steep anymore, which is kind of boring, but with the fjord view – still a nice hike! 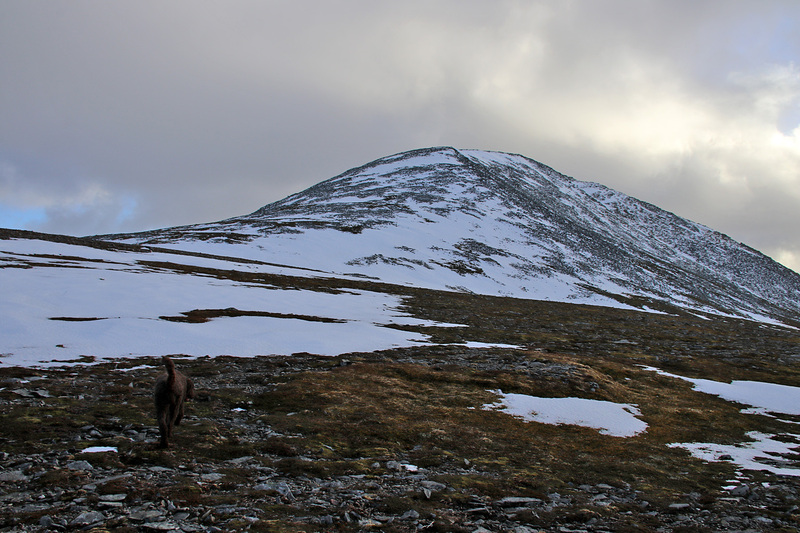 I normally seek round trip hikes, and the last time (Nov 11 2018), Karma and I hiked across Hellandshornet and Storfjellet and got a beautiful 11,7km round trip hike. But today, I just wanted to get up and back down to get back home before bedtime. Brattvåg is quite far from Gurskøya. Especially when you have wait 39 minutes for the ferry (which means I missed the previous one by 1 minute). The snow has been stabile for some time (soft), but after rain and lower temperature, it’s time for crampons in steeper snow slopes. Which I didn’t need on this hike. I avoided hard snow by staying on the west side of the ridge below the top. We reached the top 17:23, and once again I failed to reach the top within the hour. 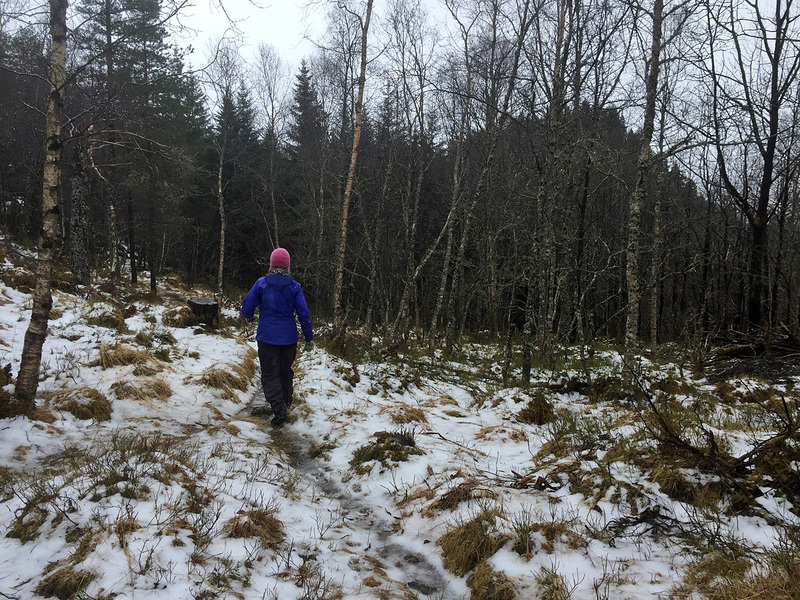 If I had skipped taking pictures and kept a more “focused pace”, one hour is definitely within reach (850 vertical meters across 3,4km) Besides, the ground was now really soggy and where I would normally barely leave a footprint, my shoes almost drowned in the mud. On our way down, the forest section was super-slippery. But I got down without slipping and falling. Friday: A hard work week was coming to its end, and life got much better when my girlfriend Anne arrived here in the afternoon. We hadn’t seen each other in two weeks. The weather outside was getting more and more nasty by the hour, and every sane individual would be most happy by staying indoors. I guess we’re not in that category, both knowing that Friday afternoon wouldn’t be the same if we didn’t get soaked and cold first. 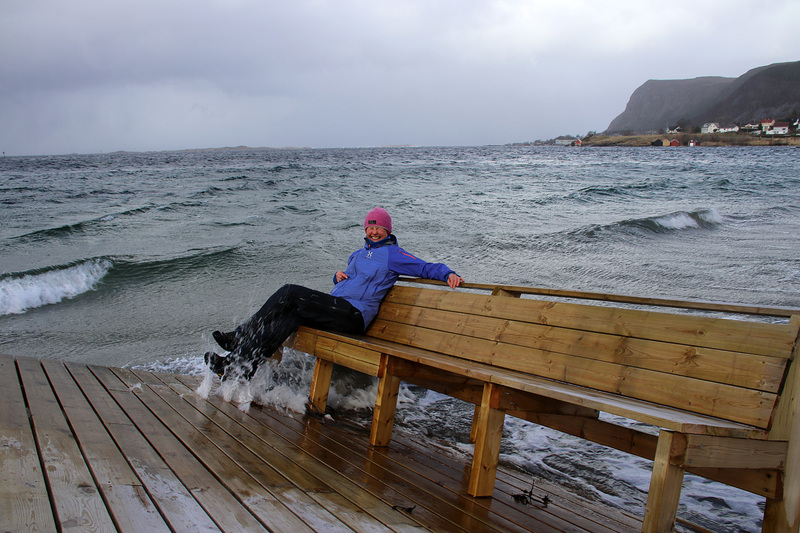 But due to the wind, we had to stay in the lower elevation. Anything higher would just be dog abuse. 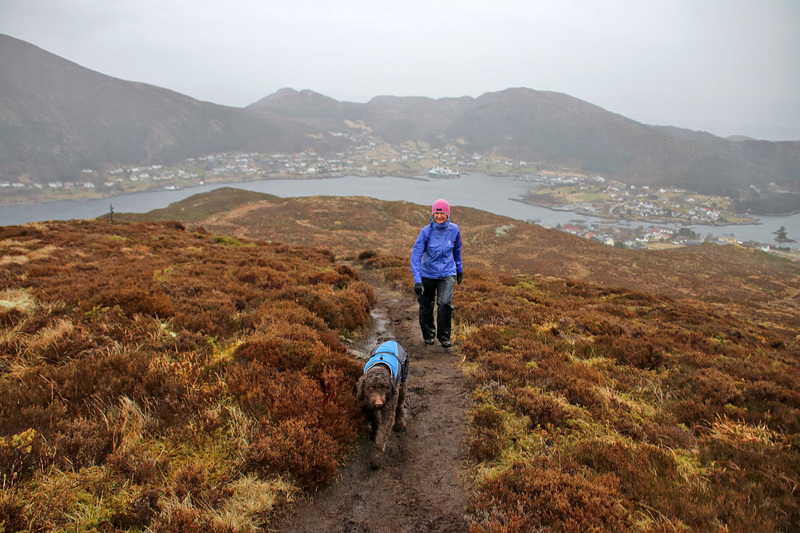 But we agreed that this trip was just a little bit too short, so we extended it by following the nice hiking trail across “Heida“. It’s actually a gravel road, just not open to cars. 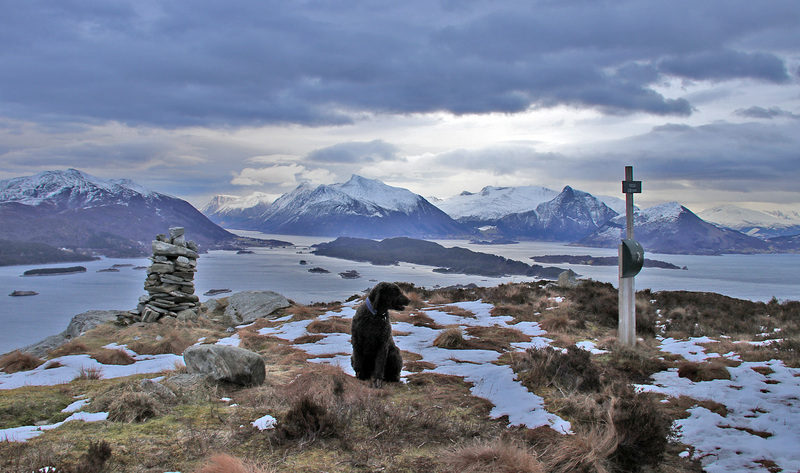 The view towards Fosnavåg is great from this trail. 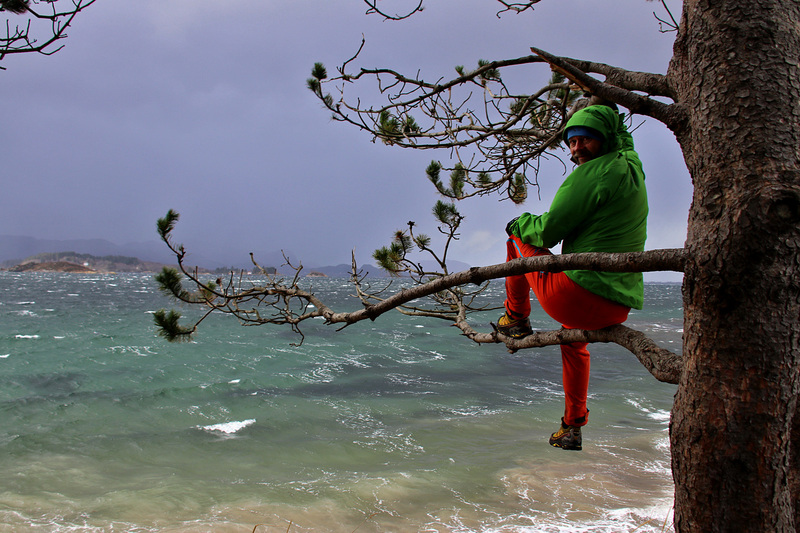 We were now totally soaked, but found joy in climbing trees on the way back to the trailhead. I didn’t know that I was cold before I hit the shower. The normal temperature of the water felt like 100 deg. C. But after that, Friday evening was ALL good! Saturday: Clearly the worst weather we’ve had this year. I hardly slept at all, while the storm was hammering on the house. Not that the house was at any sort of risk, but there were loud noises from the roof and from the terrace. 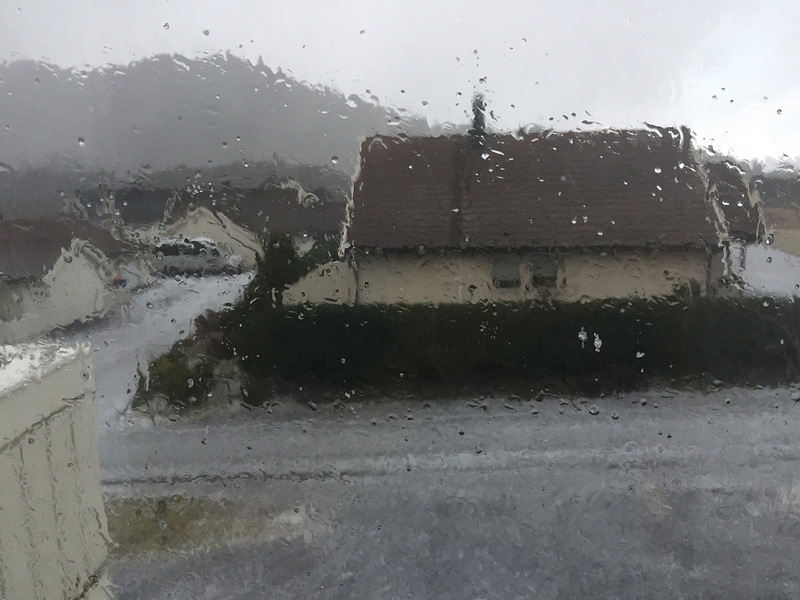 The wind in itself isn’t all that bad, but the violent hail showers that come and go made Anne and me decide not to seek higher ground today. 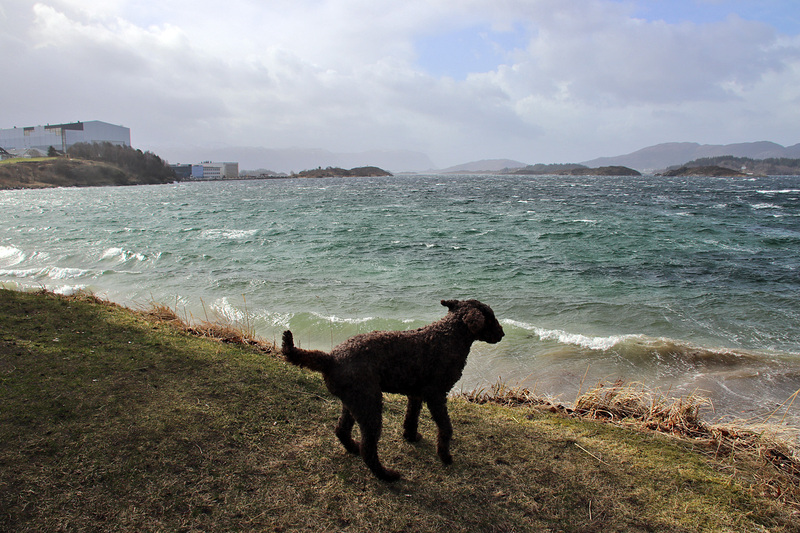 First on the agenda was a trip to town (Ulsteinvik) and then we would go to the beach to walk the dog afterwards. What a place to put up a bench!! 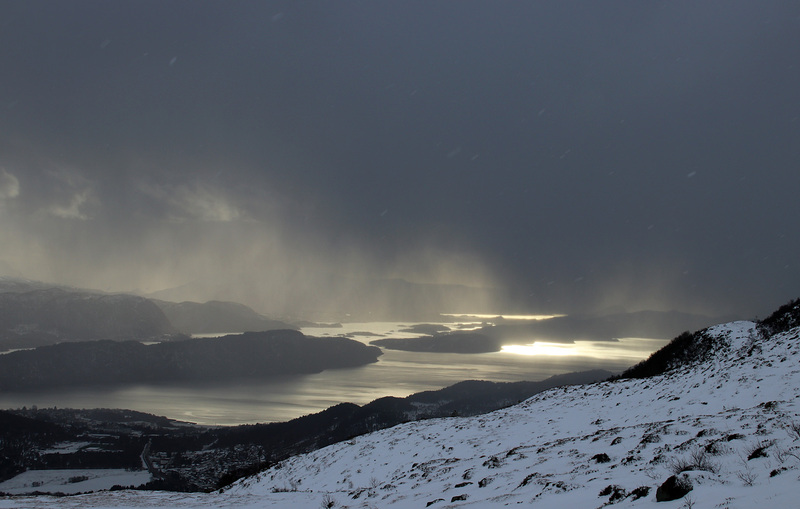 Still Saturday: On our way home from Ulsteinvik, we drove through a hail shower. 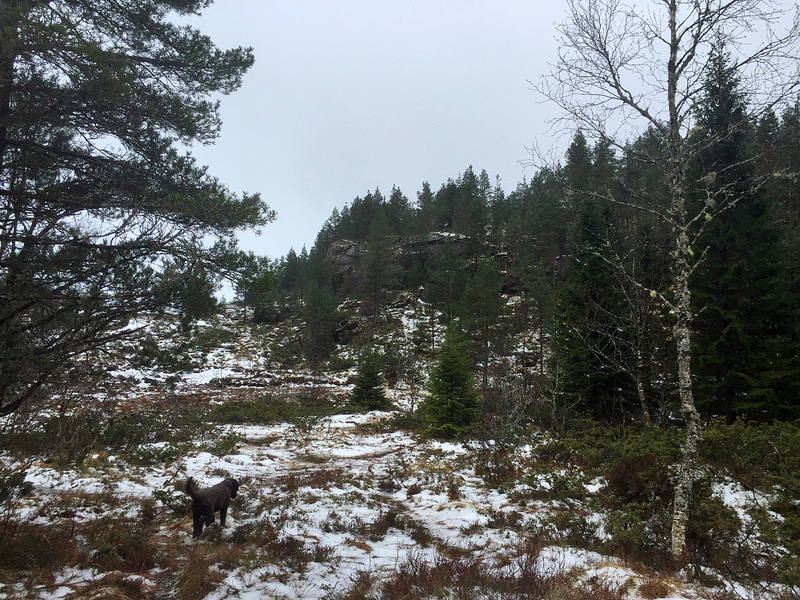 When that passed, I suggested we took a quick hike up to Kleppeåsen, where Anne hadn’t been before. 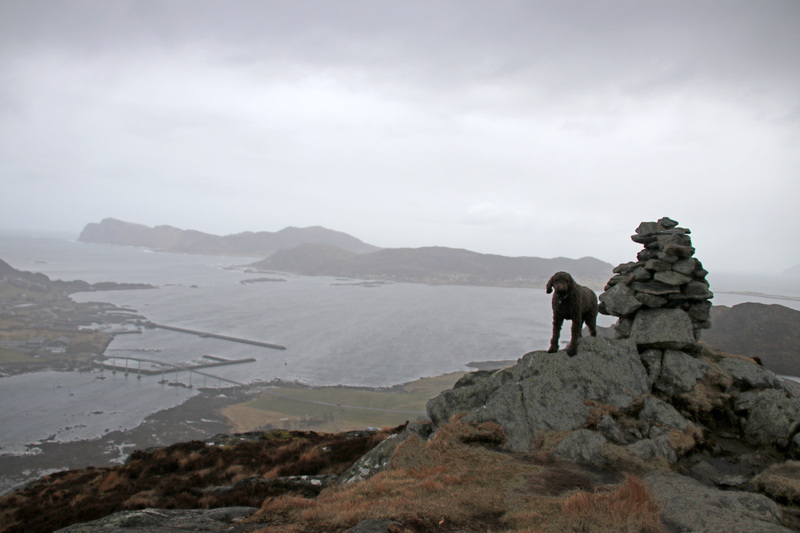 I reckoned there would be time to go up and come back down before the next shower came along. 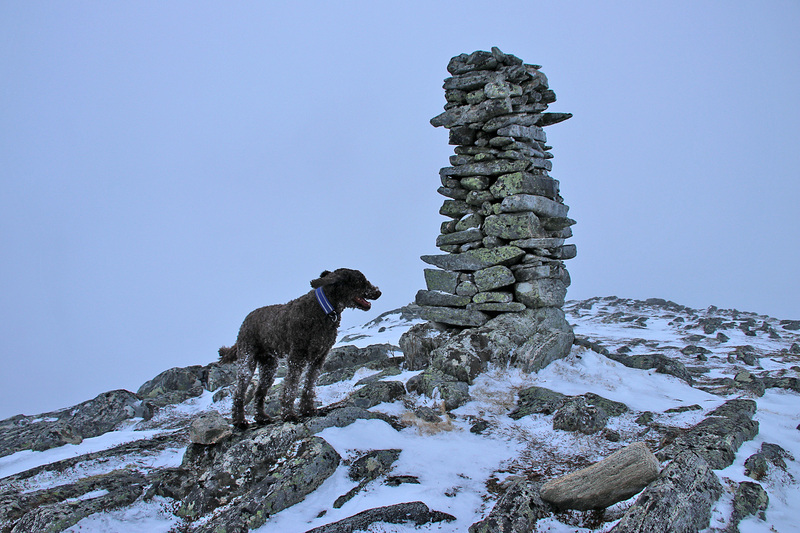 On top, I suggested that we walked the east ridge down. 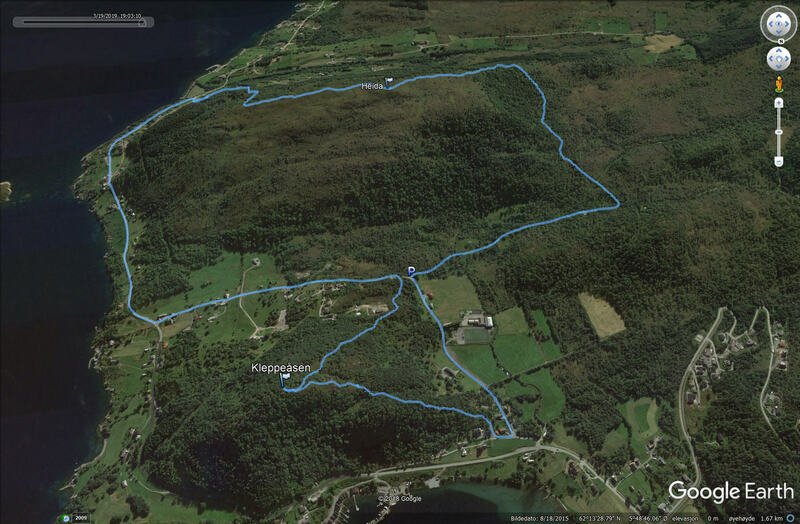 I had never done that route and I’m always in search for visiting new terrain. Near the road, we found another “Gapahuk” and a rope that we could play with for a little while. It always makes sense to practice balance training. Osnessanden: Where is the beach? 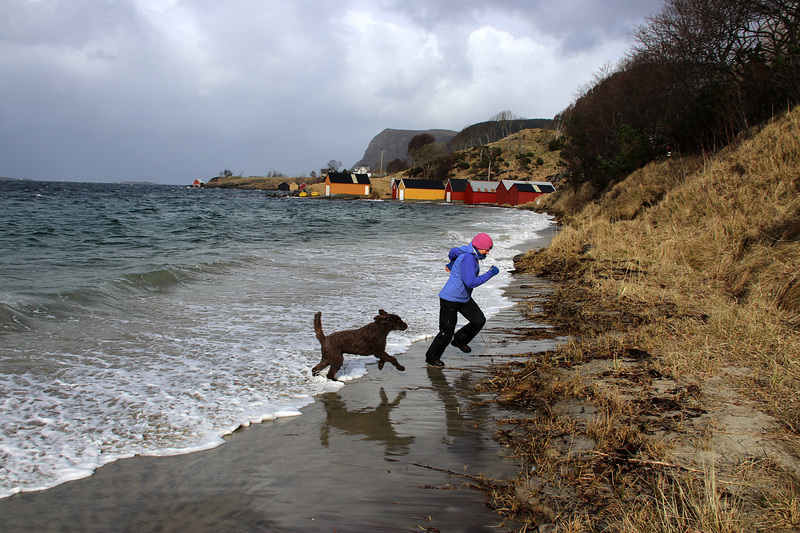 Osnessanden: OK, let’s have fun! Osnessanden: Last one makes dinner! We had to figure out something to do. No way we would stay home on a Sunday! Then something came to mind! 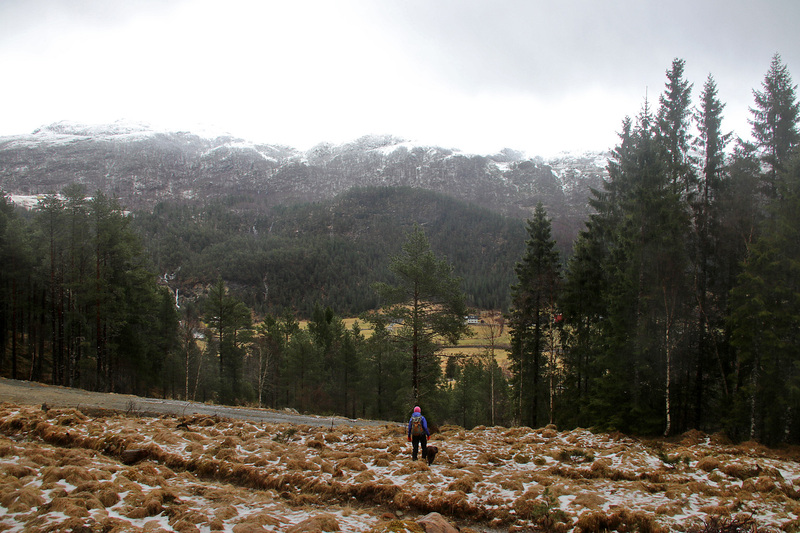 For many years, I’ve wanted to check out the two tiny protected areas in Almklovdalen valley in Vanylven. Being so tiny, they could possibly hold something worth seeing? 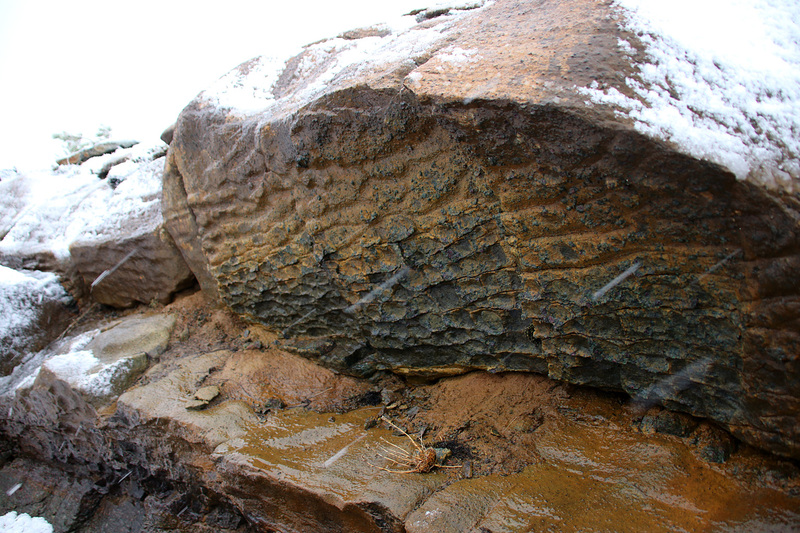 Like olivine rock – which I’m very fascinated by. 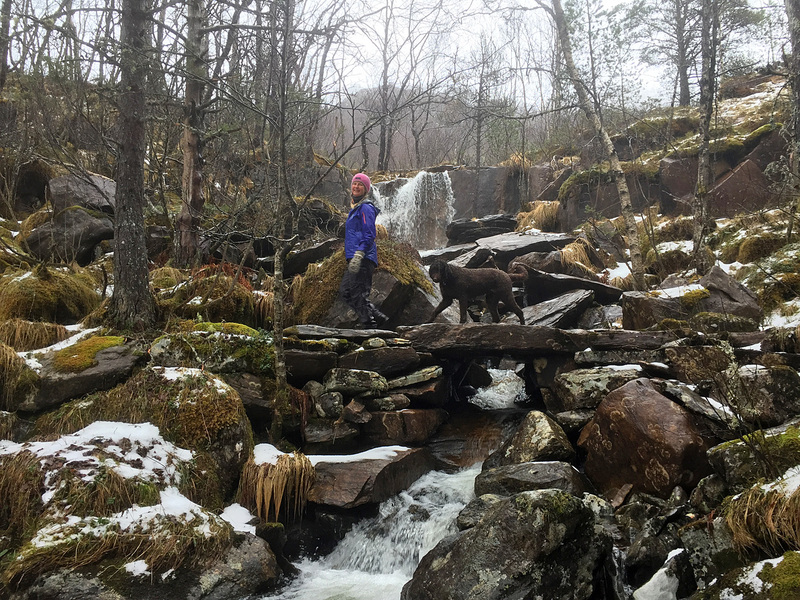 And being a park ranger, Anne like visiting protected areas as well. So, off we went. 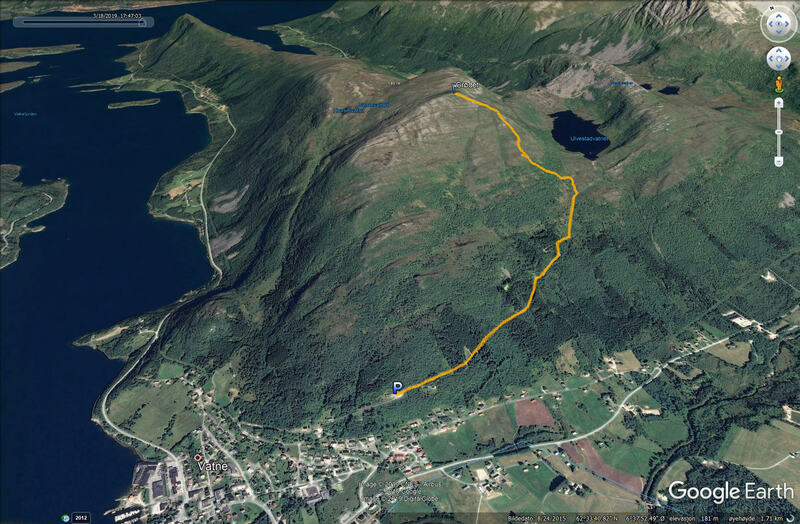 We started out at Hellebust and followed a tractor road in the direction of Helgehornsvatnet. Above the lake is Helgehornet, which I had been to – years ago – but had absolutely no recollection of the hike. It turned out that I was there in 2011, and had followed the same tractor road that we were on today. I probably had better weather back then. Today, it was pouring down. Snow is better than rain! 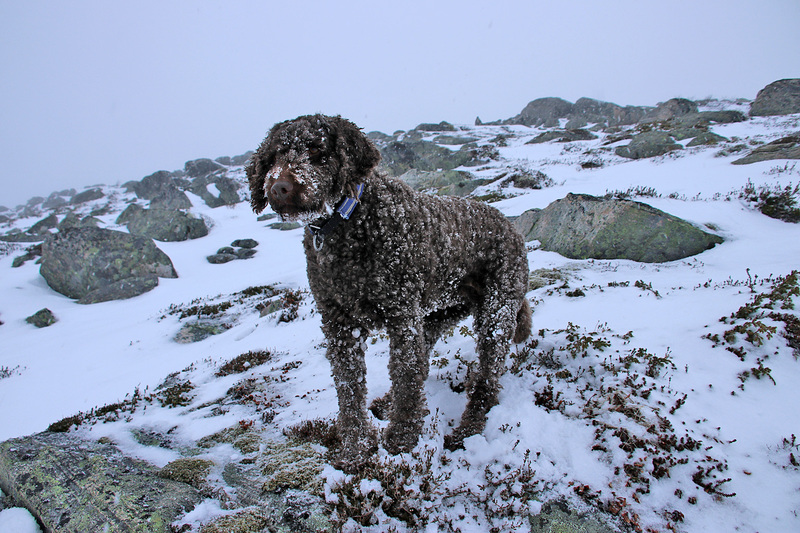 It’s probably quite cool – under the snow! 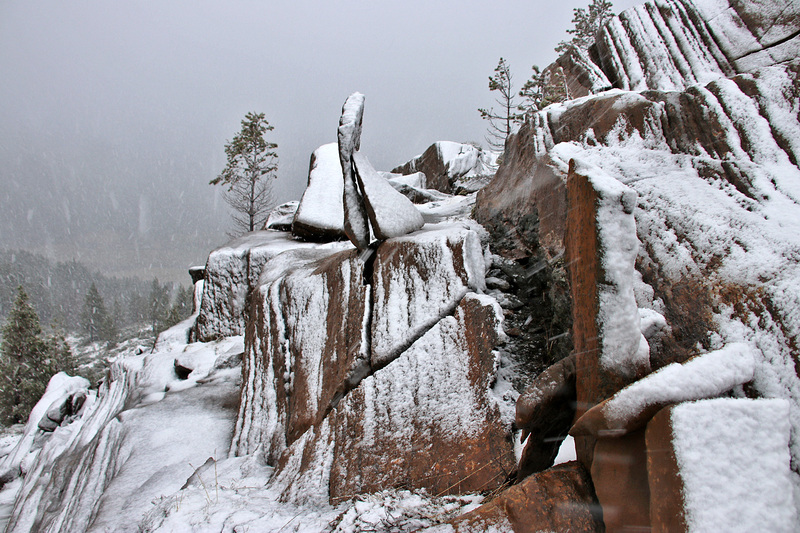 There wasn’t a whole lot of cool rock to see, but at least we got to see one or two rocks without snow. Afterwards, we went up to the Raudenausane top, just to have been there. And along the way, we got to see some more cool terrain. 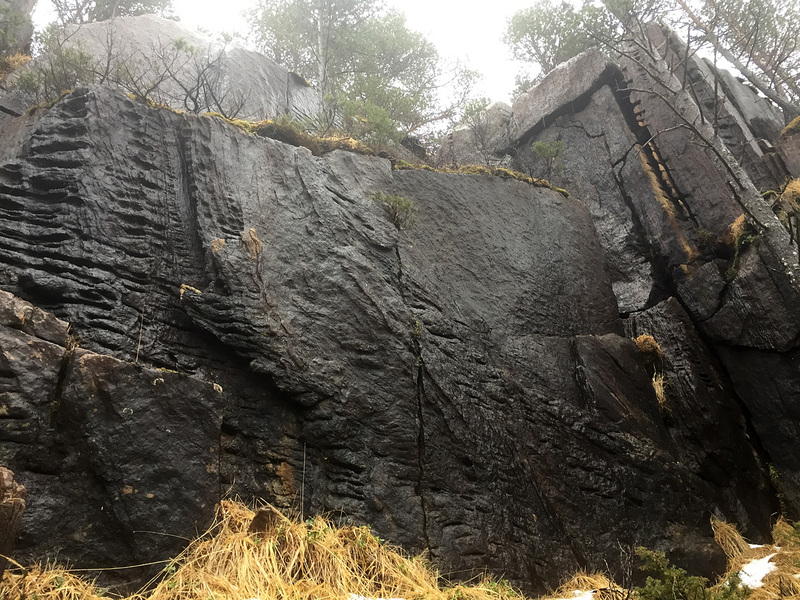 After reaching the high point, we took an extra round just to see if there were anything more exciting, before heading back down and visit the second protected area. The Raudehaugen forest top was on the other side of the valley, and I assumed that there would be some hiking involved. 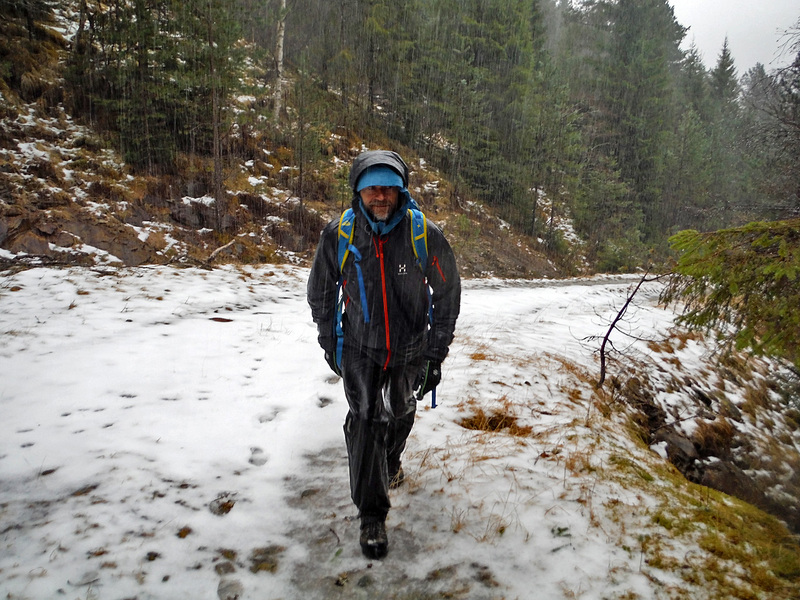 The good thing was that it had stopped snowing – which meant that it was also raining much less further down. To our surprise, we could drive a gravel road upwards (most roads here are closed because of the quarry work) and we could park almost at the same elevation as the hill we were aiming for. After a few minutes of walking, Raudehaugen appeared in front of us, and at first glance, it looked more interesting that Raudenausane. 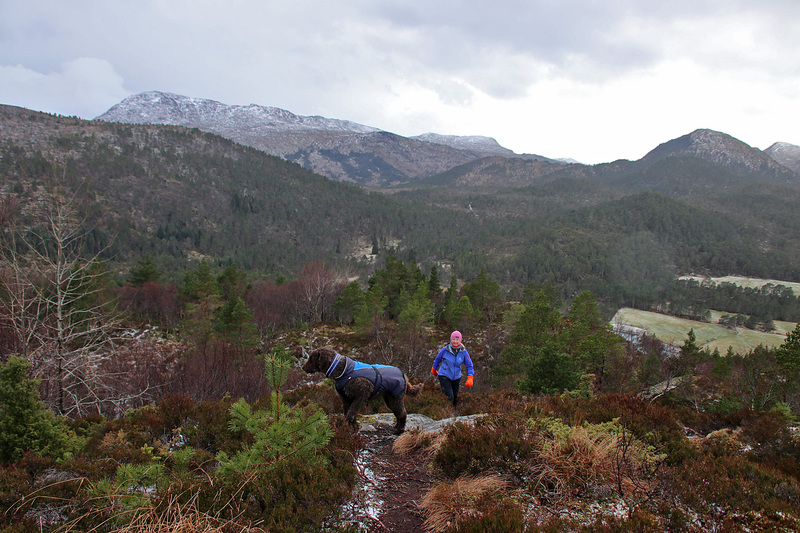 We went up to the high point and had a good view across a small part of the Almklovdalen valley. We could see some cool cliffs below us, but we couldn’t actually SEE the cliffs. 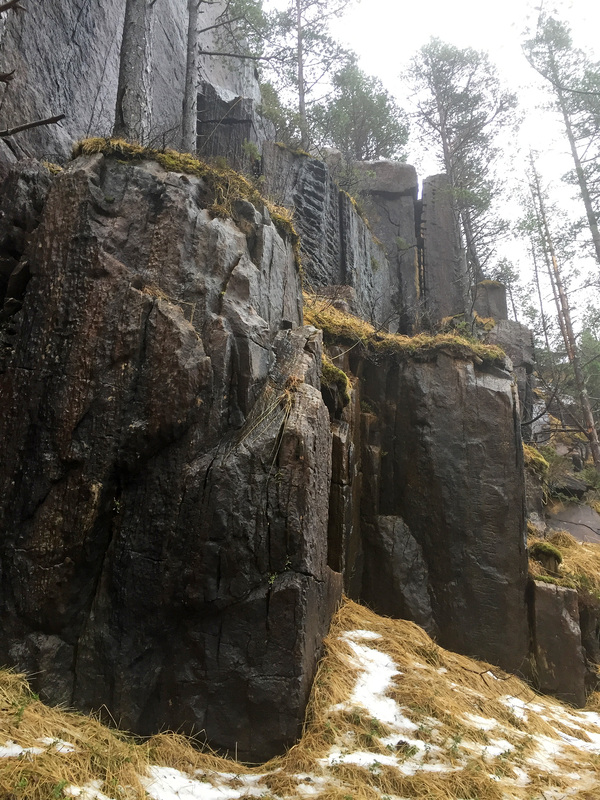 So, we decided to walk around the forest top and take a look at the cliffs from below. Very cool! The we decided to call it a day and headed back to the car. Very happy about getting out of the front door and seeing new and interesting terrain! Farewell! Nice to have been here! I’d like to go climbing!